KIM LAWTON, correspondent: Former Marine Eduardo “Lalo” Panyagua served in Iraq and the 2010 troop surge in Afghanistan. Coming home after combat was a tough transition...both for him, and for his wife, Donna Hernandez. Lalo had suffered physical injuries, but he came to realize there were other, less tangible wounds as well. EDUARDO “LALO” PANYAGUA: As a Marine, you are taught to be tough and not let small things bother you. To me, all the mental issues, the nightmares, the confusion, it was small because I wasn’t in danger. I wasn’t being attacked or in an ambush, so it wasn’t a problem for me. However, it was affecting my life little by little, and it was affecting my loved ones as well. LAWTON: Lalo was eventually diagnosed with severe post-traumatic stress. But something else was also identified: moral injury. PROF. NANCY SHERMAN (Georgetown University): Moral injuries have to do with feelings of guilt, shame, anger toward others, that’s moral. Like resentment or indignation. And they’re incurred from all sorts of things, but in war, there’s no shortage of occasions for these wounds to fester. 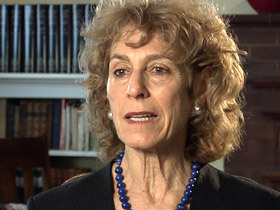 LAWTON: Nancy Sherman is professor of philosophy at Georgetown University and one of the nation’s top scholars in the field of moral injury. 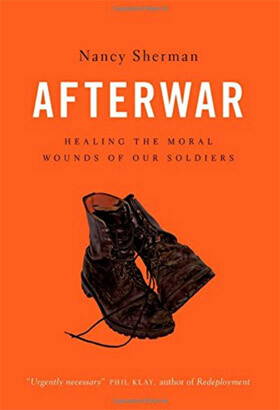 In her new book, Afterwar, Sherman explores how veterans like Lalo are suffering from moral injuries. She says the entire nation has a moral duty to help them heal. SHERMAN: I think we have a sacred obligation to our citizen soldiers. This is not a militia. This is us. It’s morally urgent just as we send citizen soldiers to war that we bring citizen soldiers home. And homecomings are really about coming home. Figuring out ways to help troops integrate and transition. LAWTON: Lalo and Donna were high school sweethearts. They grew up in South Central Los Angeles and say they wanted to find a way out of the barrios. For Lalo, that was the Marines. PANYAGUA: It just drew me—the brotherhood, the camaraderie, doing something great. LAWTON: His parents gave him permission to enlist when he was 17 and a half. In 2008, at the age of 19, Lalo was deployed to Iraq. When he returned, Donna was at Georgetown, studying foreign affairs. Before Lalo’s next tour, the two secretly eloped. Donna was 18, Lalo 20. 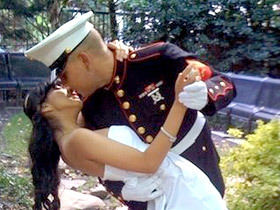 DONNA HERNANDEZ: We just eloped and the next day I had to write an essay and he had to go back to Camp Lejeune and a couple weeks later he deployed. LAWTON: On his 21st birthday, Lalo found himself on a battlefield in Afghanistan, in charge of a unit of 35 Marines, or as he called them, “his baby birds.” The fighting was more intense than what he had faced in Iraq. Three of his baby birds were killed, two of them in IED explosions. SHERMAN: You never leave a fallen comrade behind. You bring your buddies home. If you’re a philosopher, you say these are aspirations. But if you’re a young person who has that responsibility on their shoulders, that’s not how you view it. You view it as perfect duty. All or nothing. LAWTON: After he returned from Afghanistan, Lalo says the memories began catching up with him. PANYAGUA: At first I didn’t know what was happening. I was drinking every week, constantly, trying to just relax, trying to be alone. I wasn’t as social as I used to be. As my wife would say I was a ‘social butterfly.’ However, I went very internal. I’d stay, my house was my fortress of solitude. DONNA HERNANDEZ: He’d go months without smiling. He wouldn’t go outside. We couldn’t go watch a movie because he’d get anxiety attacks because of the dark room, because of all the people surrounding him. It really hurt because it felt like everybody else didn’t know the person I knew. LAWTON: Then one night, things reached a crisis point. PANYAGUA: I tossed her halfway across the room in a nightmare in sleep and when I woke up my wife was crying on the floor. I’m asking her what’s going on and she tells me "You don’t remember?" and I’m like, "No." She was like "I tried to hug you and you grabbed me and you sent me flying halfway across the room. I’ve been on the floor for the last four hours crying." And that’s when it was a wake-up call for me. LAWTON: Lalo went to see a chaplain who asked if he had been to a therapist. PANYAGUA: I was like "No, never. Why? I’m ok. I don’t need to go see the wizard." That’s what we called the therapist. There was I believe a stigma of if you aren’t right in the head, you have to go see the wizard. And if you have to go see the wizard, your military career’s over. LAWTON: After lots of convincing from Donna, Lalo began intense therapy. He got Max, a service dog specially-trained to help vets with post-traumatic stress symptoms. And through Donna’s Georgetown connections, he met Nancy Sherman, who helped him see that he had moral wounds. SHERMAN: You hold yourself strictly liable though you’re not really culpable. And you beat yourself up. And you feel the shame of falling short of your lofty military ideals. PANYAGUA: Talking to Nancy and her using that "moral injury" phrase, it really makes me think. I’m like there are things that happened, things that I feel guilty about that affect me. It’s not just the flashbacks that give me nightmares, but the thoughts of feeling guilty for something that happened or for being alive. You know, it’s really painful. It hurts. SHERMAN: Giving things a name legitimizes what you’re feeling and it also helps you to kind of explore: “Oh I’m not just thinking about these explosions or torn body parts. I’m actually thinking about my responsibility or someone else’s responsibility.” War is all about responsibility and that’s the moral piece. LAWTON: Sherman says acknowledging those feelings as moral wounds is the first step in a very long healing process. SHERMAN: You never fully lose the hurt, the feel, but you own it in a way. And you don’t, in the best-case scenario, you don’t continue to be traumatized by it. LAWTON: She says another important step is for service members to regain hope, in themselves and others. SHERMAN: To be able to have a sense of goodness about yourself, empathize with the good part of you, that’s big. That’s huge. And so those—and it often takes place not just with yourself, but interactively with other people, interpersonally. SHERMAN: She has hope in him. She has trust in him. She knows what he was like before he was rattled by war and she slowly reminds him of what he was like so he can hold onto that faint image of his good self. HERNANDEZ: I think one of the sad parts of the story is that a lot of the time when the service members are going through these situations their families also going through the situation. LAWTON: Sherman believes all Americans can play a role in recovery by working toward breaking down military-civilian barriers and building ongoing relationships. SHERMAN: Sometimes the “thank you for your service” just isn’t enough or it doesn’t go beyond that. Be willing to slowly get to know service members. 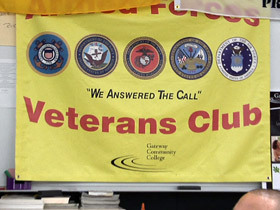 LAWTON: Now honorably discharged from the Marines, this year, Lalo attended Gateway Community College in New Haven, where there is a special “Veterans Oasis” center which tries to help returning service members transition to a school setting. It’s run by former Marine Rick Palinko. RICK PALINKO (Veterans Oasis): It gives them a sense of belonging, a sense of comfort and security. LAWTON: Donna has just earned her Master’s degree from Yale’s Jackson Institute for Global Affairs and is preparing to take on an international posting with the State Department. HERNANDEZ: Now it’s kind of my chance to serve the U.S. now that he’s been done with his service. LAWTON: Wherever they end up, Lalo hopes to earn his bachelor’s degree. PANYAGUA: I want to reintegrate into society. I want to be somebody that can give back to this great nation. LAWTON: And together, they want to help raise awareness among other vets and their families about the realities of moral injury and the resources available to deal with it. PANYAGUA: You never really fully recover, you never fully heal, but everyday I’m healing more and more, and having her by my side, having her know what’s going on and being so supportive, it’s been great toward the healing factor. LAWTON: I’m Kim Lawton in New Haven. In her book Afterwar: Healing the Moral Wounds of Our Soldiers, Georgetown University philosophy professor Nancy Sherman argues that many of the 2.6 million U.S. service members returning from our wars in Afghanistan and Iraq suffer from complex moral injuries that are more than post-traumatic stress and that have to do with feelings of guilt, anger, and “the shame of falling short of your lofty military ideals.” Citizens have “a sacred obligation,” says Sherman, to morally engage with those who have fought in our name and who feel moral responsibility for traumatic incidents they experienced. 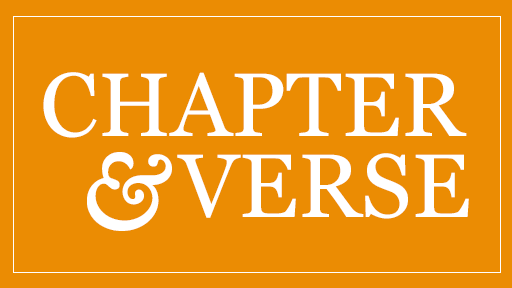 Managing editor Kim Lawton interviews Sherman about the moral aftermath of war and visits a former Marine and his wife to talk about the healing that comes through listening, trust, hope, and moral understanding. Many who return from war are dogged by profound disappointment in themselves and the sense that they have fallen short of ideals of what it is to be a good solider. Sometimes the disappointment stems not from wrongdoing or evil, but from an over-idealized sense of good soldiering, or an intolerance for good and bad luck in war. In a related way, some may feel (subjective) guilt that doesn’t track culpability or wrongdoing. In some of these cases, there may be causal but not moral responsibility at work, such as when an individual is the proximate cause of a nonculpable accident. In other cases, merely surviving when a buddy doesn’t, without any sense of being the agent or cause of that buddy’s death, unleashes deep guilt and despondency. Hope in the face of evil is another matter, either when one is the victim of evil or when its perpetrator. There is no shortage of evil in going to war and killing and maiming for a cause that may not be just or at least is imprudent, as many in the public increasingly regard the wars in Afghanistan, and—especially—Iraq. …This may speak to all sorts of issues, including an enlisted military and not a drafted one, a conservative-leaning military, a military that swelled in the wake of a patriotic surge after 9/11, or wars that have wound down only to be reignited. I suspect there will be far deeper disillusionment as the experiences of investing $2 trillion and too many lives in Iraq and Afghanistan leave little lasting impact in those regions. The experience of some of the Marine veterans of the bloody Fallujah invasion of the Anbar region of Iraq in November 2004 may be indicative here. The battle that wrested the insurgent-held city was fierce and costly, and for the Corps a defining moment of the twelve years of war in Iraq and Afghanistan, with nearly 100 Marines killed and hundreds wounded. When the city fell back to insurgent Sunni forces with Al Qaeda links in January 2014, shock waves of disbelief ran viral through the close-knit Marine community who fought in that battle. Wirth the fall came a lost sense of the mission and what they cook themselves to accomplish. As Kael Weston, a State Department political adviser who worked closely with Marines in Fallujah and later Afghanistan put it, “This is just the beginning of the reckoning and accounting.” The reckoning will come, and with it the shifting grounds of hope or despair. This is a future story to be told for these veterans and for many others who have served in these wars. Early on in the philosophical record, Aristotle invokes that image of a friend as “another self,” a “mirror,” not for narcissistic reflection, he insists, but for self-knowledge “when we wish to know our own characters…and direct study of ourselves” is near impossible. The background assumption in Aristotle’s claims is that we are not empty vessels for others’ aspirations, but we are aspirants who can’t do without others’ support, trust, and compassionate critique in articulating how to live well and then trying to live that life. For a returning veteran, recognizing that another has invested hope in you can be profoundly transformative. It can nourish hope in oneself and sustain hope for projects that rekindle a sense of meaning and purpose after war. It is an important moment in healing.